Juan Martin Fernandez Lobbe is one of Argentina's greatest ever Test players and he led them into their first Rugby Championship. Buenos Aires born Lobbe made his first international appearance for Argentina against Uruguay in the 2004 South American championship. Alongside brother Ignacio he has become a fixture of the Pumas side since their rise to prominence in world rugby. A versatile back row, Fernandez Lobbe has played internationally at both openside flanker and Number 8. He scored a try in each of Argentina's test victories over Wales in June 2006 before starting at openside in the Pumas' narrow 25-19 loss to the All Blacks later that summer. Fernandez Lobbe established himself as indispensable in the Pumas' growth as an international side, featuring in the victory over England at Twickenham in November 2006 and the two test series win over Ireland in 2007. Selection for the 2007 Rugby World Cup squad was secured with impressive form at both international and domestic level. He started all of Argentina's matches en route to their semi-final defeat at the hands of eventual champions South Africa. 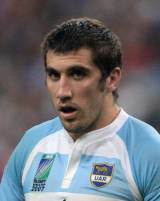 Fernandez Lobbe retained his place in the competitive Argentina squad for the summer encounters with Scotland in 2008 and in August that year he was included in the Argentina squad to play South Africa to celebrate Nelson Mandela's 90th birthday. He led his country for the first time in the defeat to Ireland in November 2008 and retained the captaincy the following year in the absence of regular skipper Felipe Contepomi - steering the Pumas to victory over England in Salta. On the domestic front, he began his playing career at amateur level with Liceo Naval in Argentina before signing professional terms with Guinness Premiership side Sale Sharks, making his debut against Leicester Tigers in 2006. He opted for a switch to big-spending French Top 14 side Toulon in the summer of 2009. After two seasons as a frequent name in the Toulon back-row - Lobbe was called up to the Argentinean 30-man squad for the 2011 World Cup. Argentina failed to live up to their 2007 heroics but they caused the All Blacks a scare in their quarter-final. Lobbe returned to Toulon for the 2011-12 season and he finsiehd the campaign leading the Pumas into the inaugural Rugby Championship. Lobbe was undoubtedly one of the players of the tournament and although they failed to record a win, Argentina were praised for their impressive first foray.